Physical characteristics: Spotted munias look alike with respect to males and females. 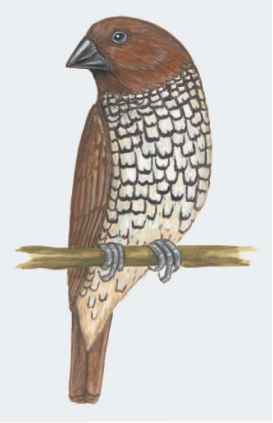 They have big heads and large, conical bills, brown, scale-patterned feathers on a white breast and flanks, and a dusky brown face and throat. 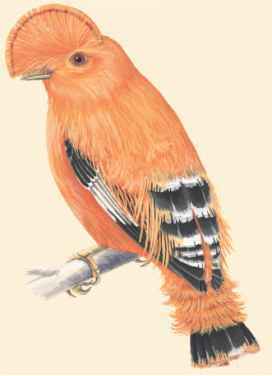 They also have plain brown upperparts and small grayish traces on rump. Juveniles have brown upperparts and buffy under parts, but do not have the scaled pattern on their under parts. Adults are 3.9 to 4.7 inches (10 to 12 centimeters) long. been introduced in Australia, Puerto Rico, Hawaii, Japan, and the Seychelles. Habitat: Spotted munias inhabit open or semi-open habitats including cultivated and inhabited areas, parks and gardens, rice fields, grasslands, and forest edges. Diet: The birds eat grass seeds, especially rice, from off of the ground and on live plants. They also eat small berries. Sometimes, they eat dead animals along roadsides. When human trash dumps are available, they are seen removing scraps of food, such as bread, from the area. Behavior and reproduction: Spotted munias are often found in large flocks of birds of various species. Their call is a series of repeated "kitty-kitty-kitty." Their wide variety of calls is used for keeping in contact with other birds or to express alarm. The soft song is a "klik-klik-klik" followed by a series of whistles and ending with a "weeee." The song has many variations. A breeding colony is often built consisting of hundreds of round nests of grass and tree bark. Females lay three to seven white eggs. The incubation period is about fourteen days. Spotted munias and people: People often keep and breed spotted munias. Many are caught for eventual sale into the pet business.